Imagine being in your home 24 hours a day, without the ability to drive and difficulty accessing any sort of public transportation. On top of that, imagine having chronic pain and trouble with your hearing making it difficult to communicate with anyone over the phone. Would you feel isolated? Irritated? Alone? For thousands of seniors, this is just their scenario, and insights into the lives of seniors living at home are revealing that a lack of transportation can often lead to a significant feeling of isolation. According to Martha Blaine, Executive Director of the Community Council of Greater Dallas, transportation is an important part of feeling connected. “If they don’t have access to easy and affordable transportation, they become isolated. They end up staying where they’re living by themselves and they change their entire pattern of interaction, which is part of what keeps them healthy and engaged,” Blaine said. While cities like Dallas work to better prepare their areas with local transportation programs and senior transit, home care agencies armed with the power of a home care software or home care system like ClearCare Online can play a vital role in getting seniors out of the house. 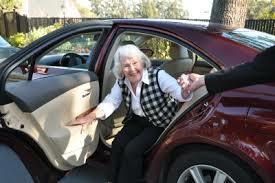 The ability of a home care worker to transport seniors is a vital component of elder care for seniors living at home who are no longer able or comfortable driving. By hiring a home care agency that utilizes a home care software or home care system, like ClearCare Online, robust scheduling tools can help ensure that seniors get where they’re going when they need to. For example, if a senior has a weekly activity or perhaps an unexpected medical appointment that a family caregiver is unavailable for, an agency using a home care software or home care system can quickly look up which caregivers are available and schedule the shift. With telephony-based tasks entered into the home care system, caregivers will also have a reminder at hand of when and where seniors need to go. While some home care agencies offer transportation as part of their home care services, others may have specialty transportation services, like ClearCare Online users September Services, also based in Dallas, Texas. Beyond home care, seniors can also find transportation assistance from local organizations like dial-a-ride, senior taxis and public transportation, all of which are committed to helping seniors stay mobile and socially active.